Our Day 4 campsite to the south of Byng Inlet was an interior one away from G’ Bay; it faced east towards Marjory island and the mainland so we missed out on a sunset. We were, however, treated to a beautiful sunrise as we crawled out of our tents shortly after 6:30 the next morning. 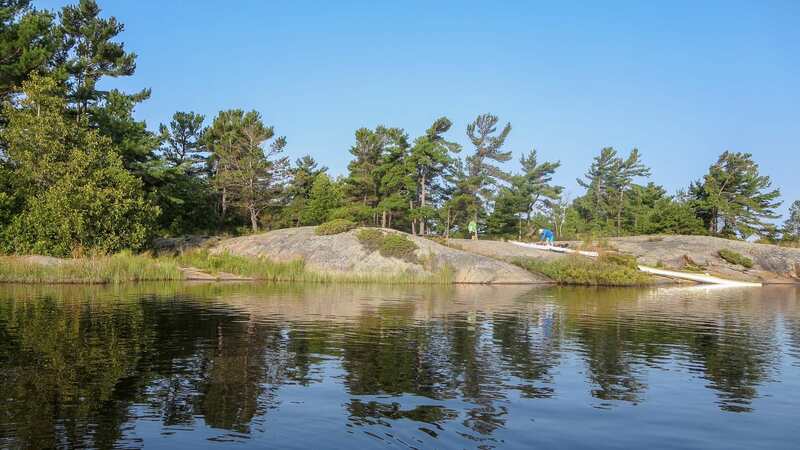 By 8:30 we had left our campsite (pictured below) and were making our way to another of Rick’s favourite little spots – a small island on the south side of Norgate Inlet and across from Duquesne Island with its rebuilt lodge. He kept the specific nature of the stop a secret until we actually got there! 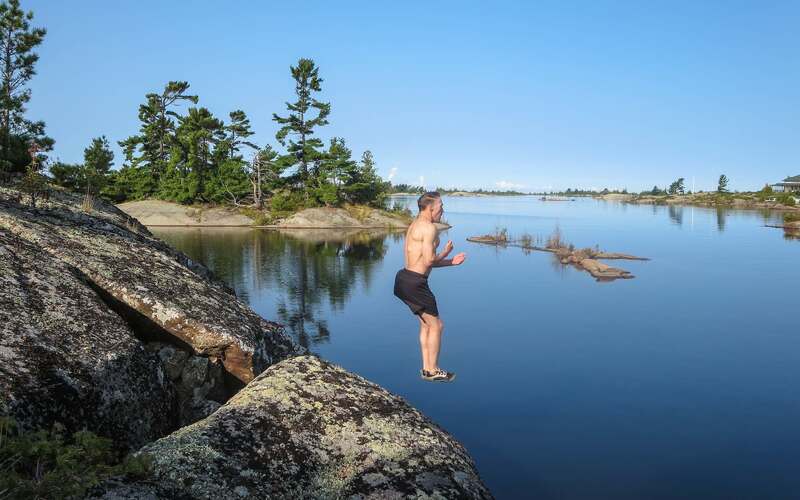 Well, it turned out that this was the Jumping Rock – or, at least, one of them! Rick and Ken took advantage of the rock and the warmth of the morning and dived in for a little swim. Meanwhile I – not really a keen swimmer! – walked my Canon Elph 330 p&s around to frame the scene from different vantage points! 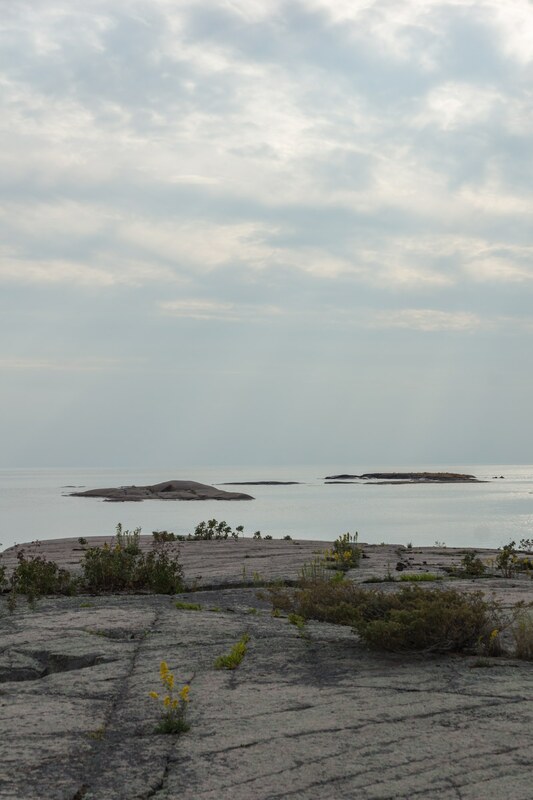 After our little break, we’d spend the next hour and a half heading down the coast and not feeling the need to stay especially close to the shore – the water was that calm. By 11:30 as we crossed Charles Inlet it was time to check out another spot from Rick’s special tour map. He called it an art installation but Ken and I were not quite sure what that could be. When we saw the piece of whimsy pictured below we couldn’t help but express our approval. 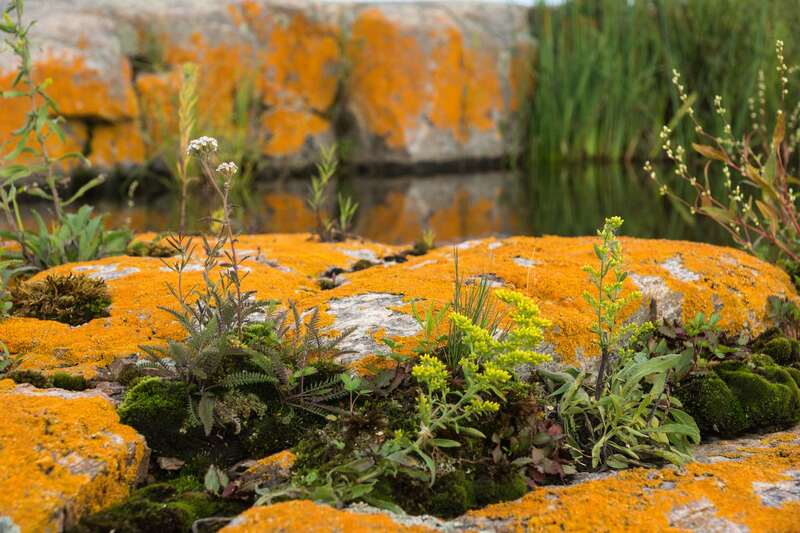 Unfortunately, the image I framed does not do justice to the clever adaptation of a random slice of nature. 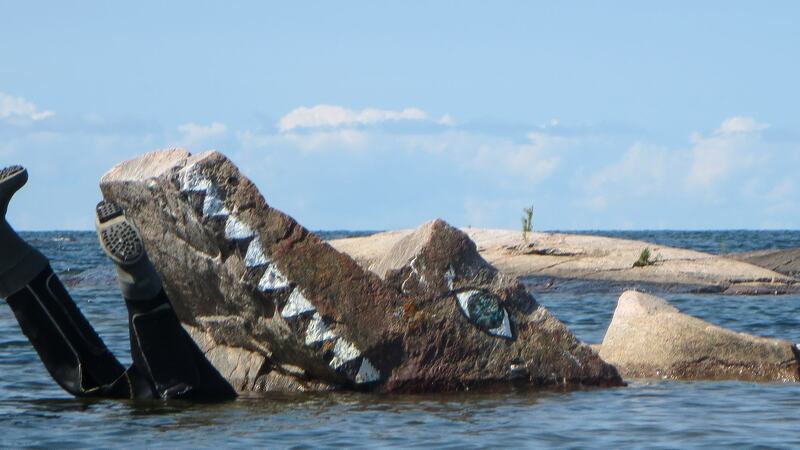 Not clearly shown are the two legs of the fisherman being swallowed by the sea monster! The lack of a viewfinder and the washed-out LCD screen meant I was shooting blind. 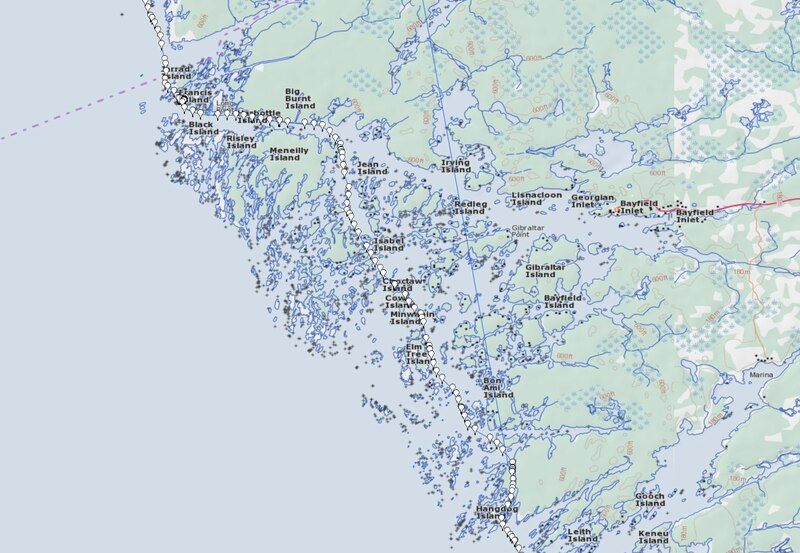 As the map below shows, we paddled through a maze of islands across Bayfield Inlet all the way down to our early stop for the day on Hangdog Island and another terrific campsite. We had stopped so early that we actually had lunch when we got to the campsite! 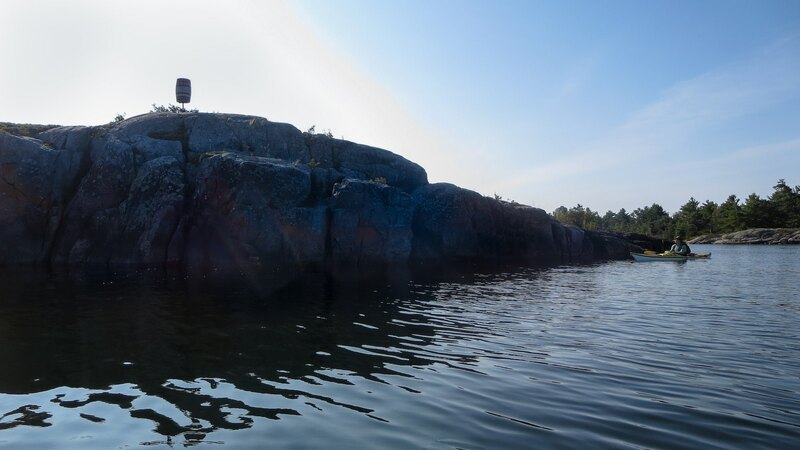 Day 5 – another in a string of memorable days paddling the north-east coast of Georgian Bay! The next day would have enough “eye candy” and history to be perhaps the best single day of the trip! 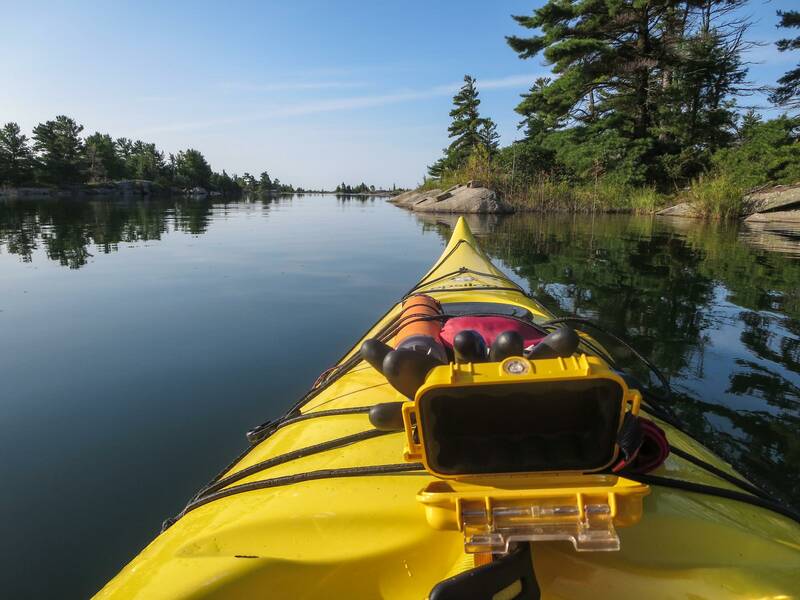 The shot below shows the deck of my rental kayak and the waterproof (well, IPX7) Pelican case that I kept my Canon Elph 330 in. The p&s was always accessible for quick shots and the results are usually acceptable. Ripple-free water this morning, eh! 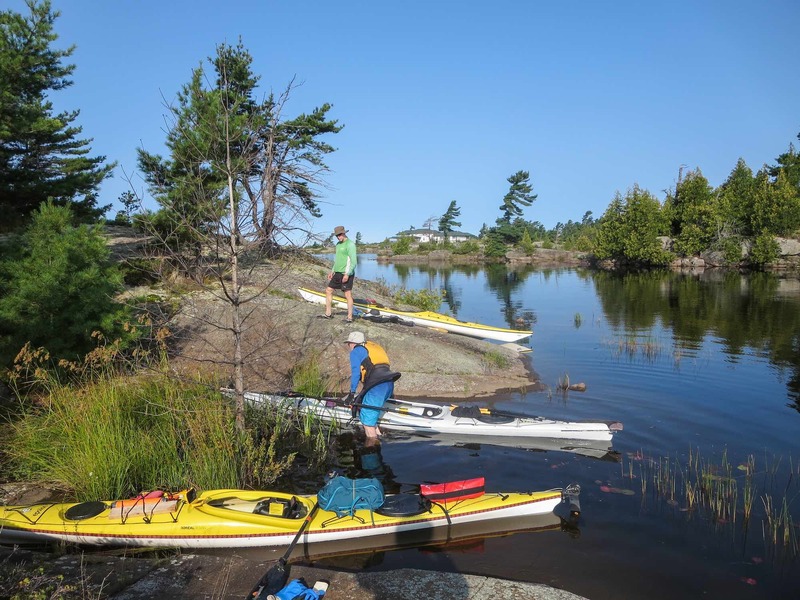 We left the campsite at about 8:30 … an hour later we were approaching Pointe Au Baril (it is pronounced Point O’ Barrel with no French twist to it at all!). 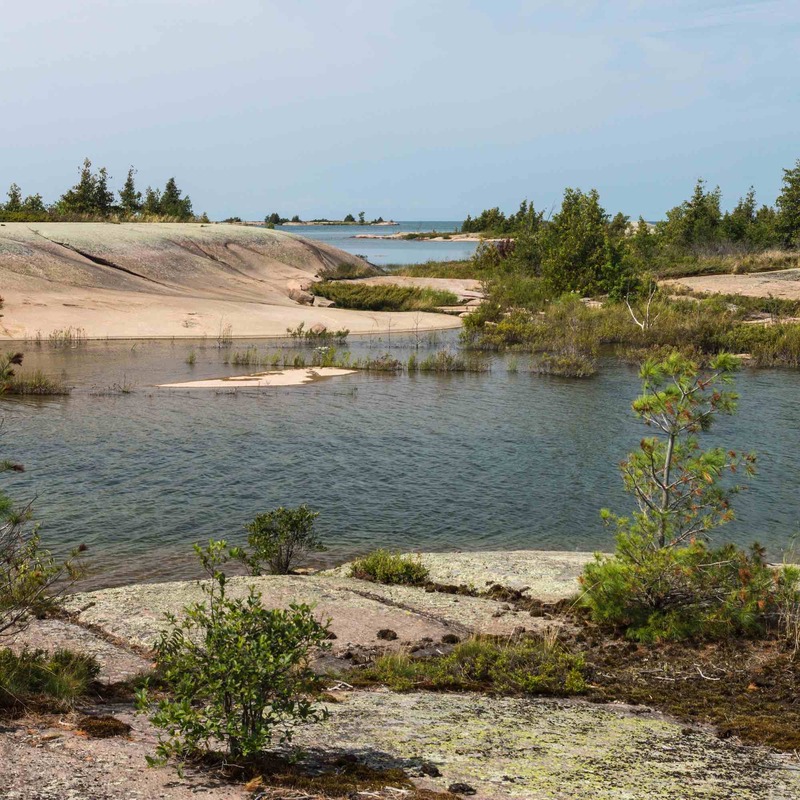 Before the trip, I had taken a closer look at the topos of the Pointe au Baril area between Highway 69 and the Bay. I have gone past a hundred times over the years but never knew that it was such a popular cottage destination. 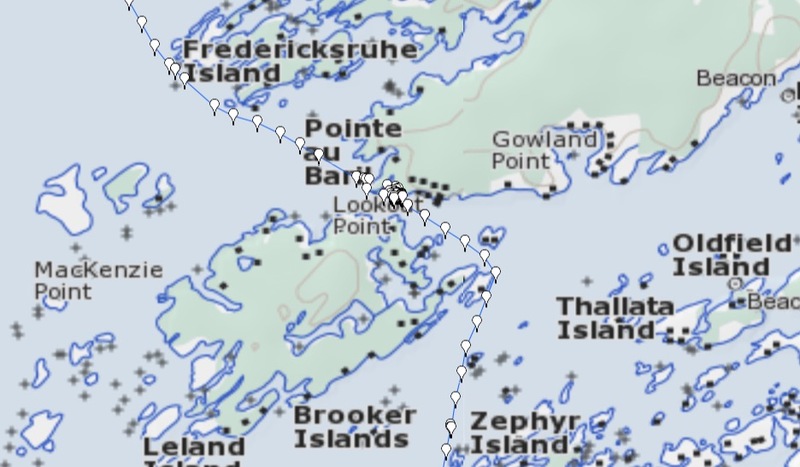 So – given that it was a Sunday in prime time cottage season – we did see the most boat traffic and cottages of our entire trip this morning as we travelled through the maze of islands pictured on the map above. It was not really as bad as I had expected! 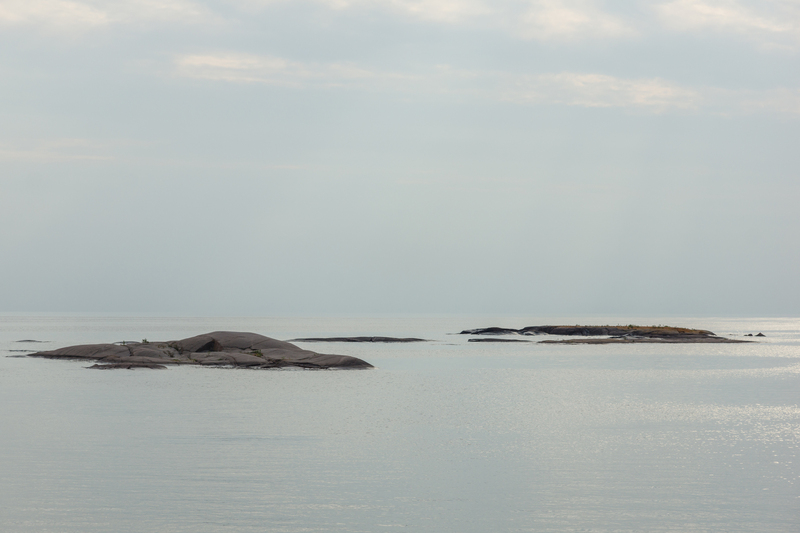 We had another diversion this morning – a visit to the lighthouse and its keepers at Lookout Point. 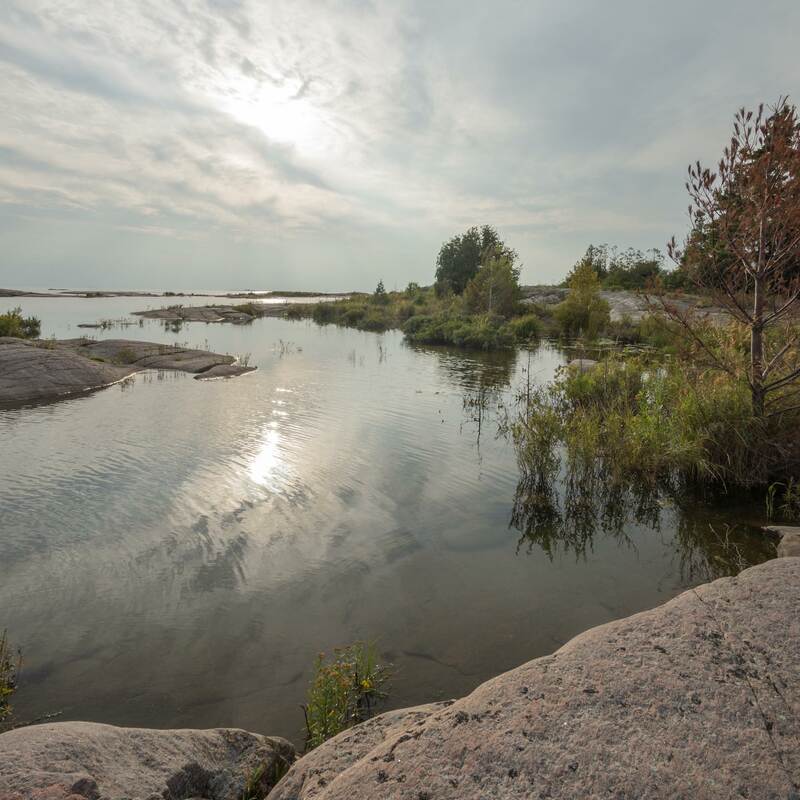 It was at this point that fur traders found a barrel of brandy – or was it whisky? – one spring in the 1870’s (a suspect date which seems a hundred years too late!) that had been lost by another crew the year before. Some serious partying ensued and the point had its name! As we approached I pointed my p&s Canon east at the barrel and the morning sun. The reward was the blown-out image of the barrel on a stick you see in the photo below! 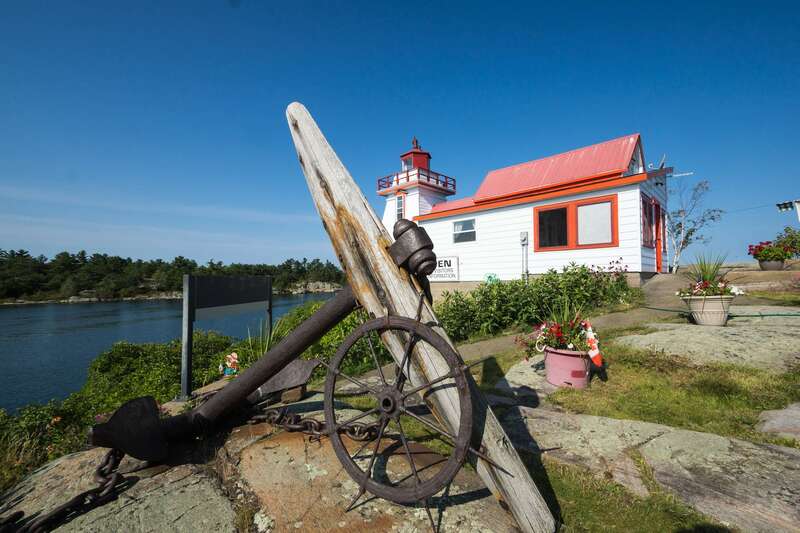 Pointe Au Baril lighthouse at Lookout Point – note all the cottages nearby! 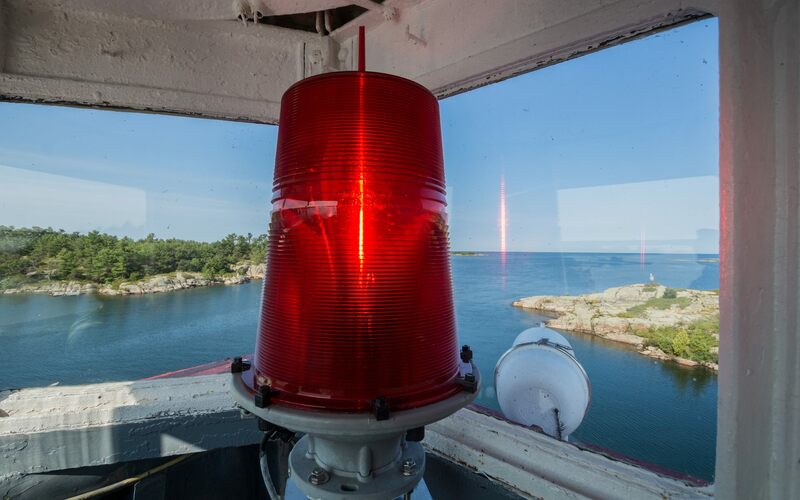 A few years after the barrel was installed at the point, a mariner’s light was added. Over time increasingly permanent structures were built. 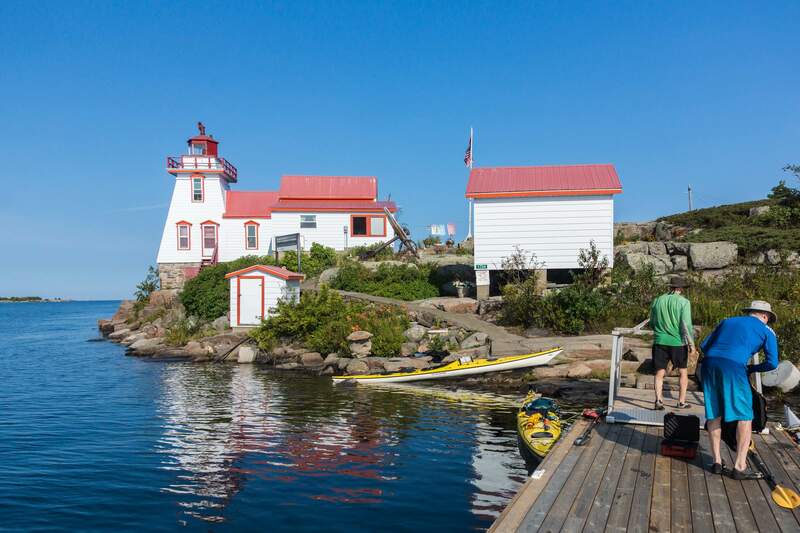 We would spend a half-hour checking out the current lighthouse, built around 1900. It is a tapered square wooden structure with a light at the top which was automated in the early 1980’s. Attached to the light tower is the keeper’s cottage; in our visit, we met the legendary current keeper, Emmaline Madigan. 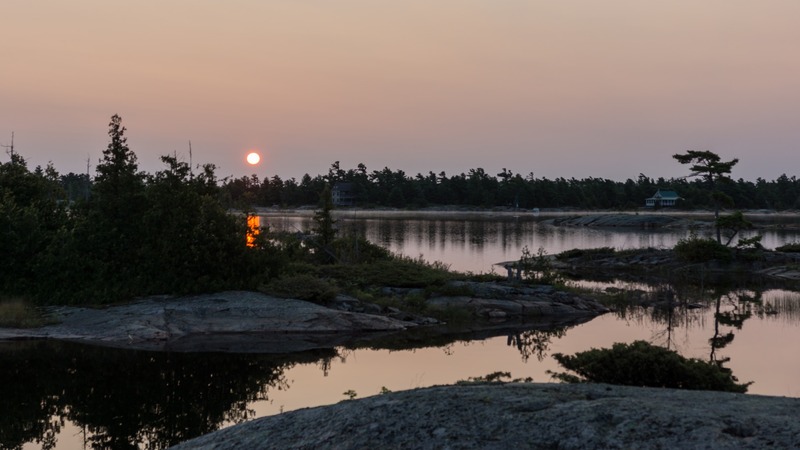 Pointe au Baril panorama – click on to enlarge! I framed a shot of the anchor, a piece of marine salvage found by the keeper’s daughters in the 1990’s while trolling nearby and brought back here. It is thought to belong to the steamship Asia which sank in September of 1882. 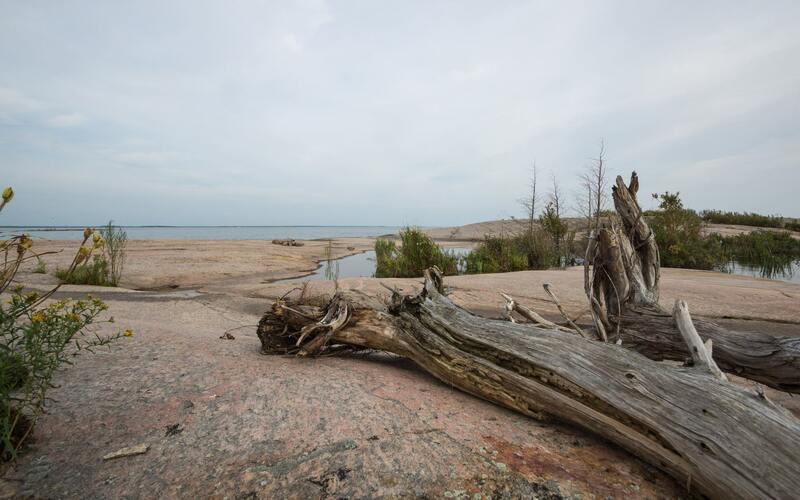 An interesting article on Madigan and her life can be accessed here (The Ojibwe Hotel Historical Preservation Society website). Also, check out the Youtube video below for more background on Madigan’s life and her sixty-year-plus connection with the lighthouse. After being dismissed when the lighthouse was automated in 1983, she was invited back in 2000 after local authorities took over management of the lighthouse. 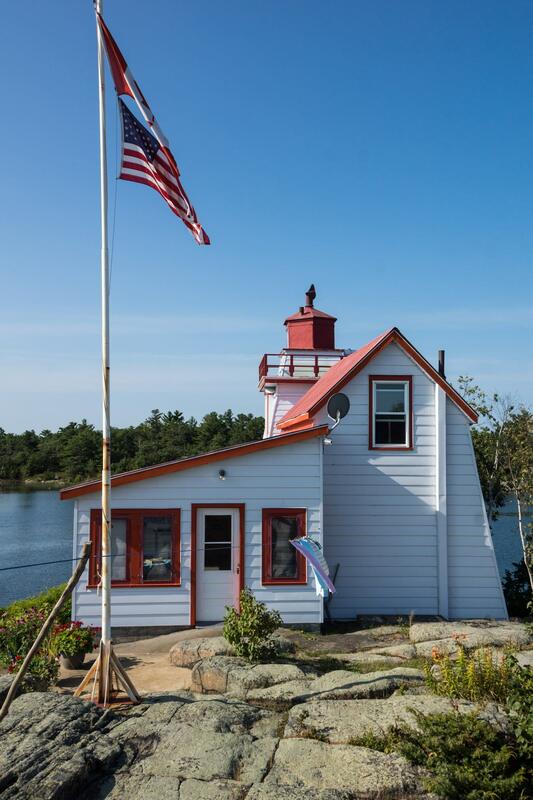 She is in her beloved lighthouse from May to September and visitors are welcome to tour the structure and chat. We were glad to have stopped in this Sunday morning to meet Emmeline and her new partner Bill Puglsey. The climb up to the top of the tower was a bonus! Back in the kayaks, it was southward. 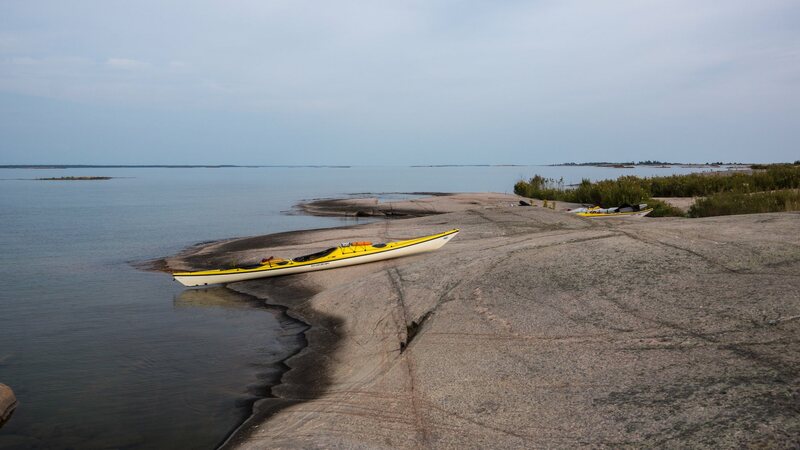 it would have been nice to paddle a bit east to check out the old Ojibway Hotel – now a sailing club but with a public restaurant – but that will be another for another trip! 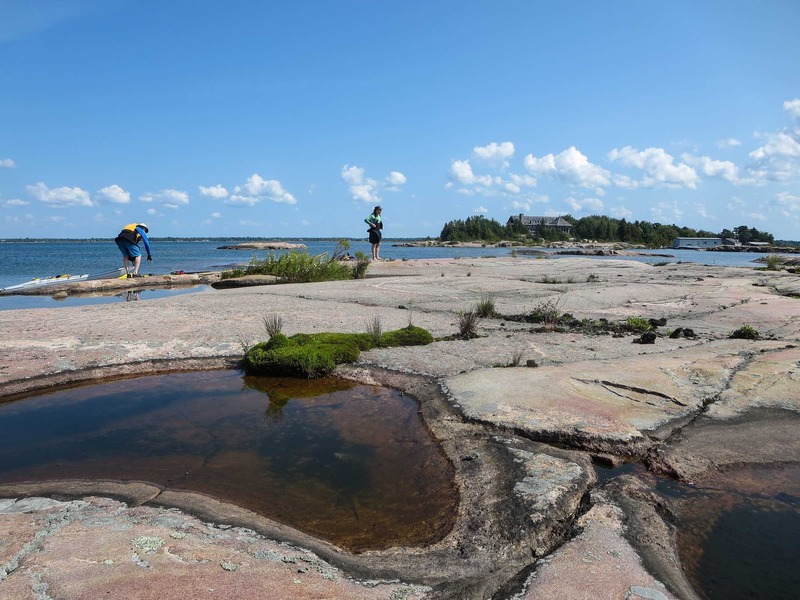 We did take a brief break on some flat rock just across from Kishkadena Island and its huge residence. A bit of googling a few days later turned up more information on the property, the Kishkadena Island Beach House, a 4-acre property with a 5000 sq. ft. cottage. It recently sold for the asking price ($3,950,000.) See here for the details. Our lunch stop would be at the north end of Big McCoy Island. It was a sunny day and shade was at a premium but we did find a few trees that provided some respite from the sun. Lunch done, we headed west on the channel between Big McCoy and Agassiz Islands. a view from the north end of Big McCoy I. 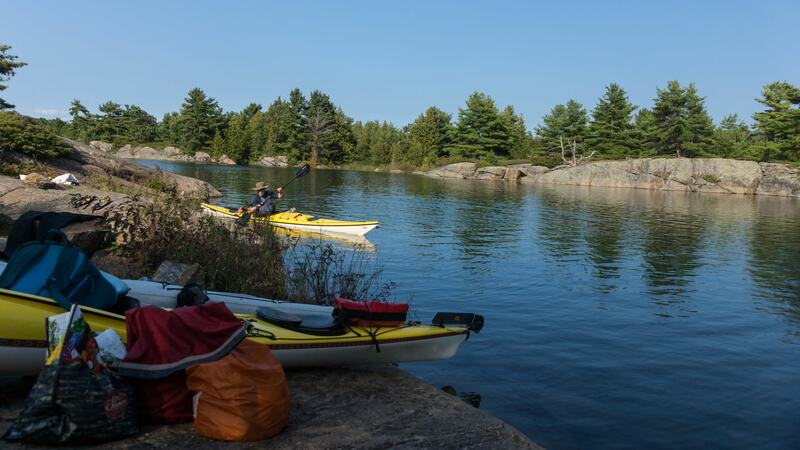 Then we paddled to the west side of the island and down the east side of Chippewa Island. 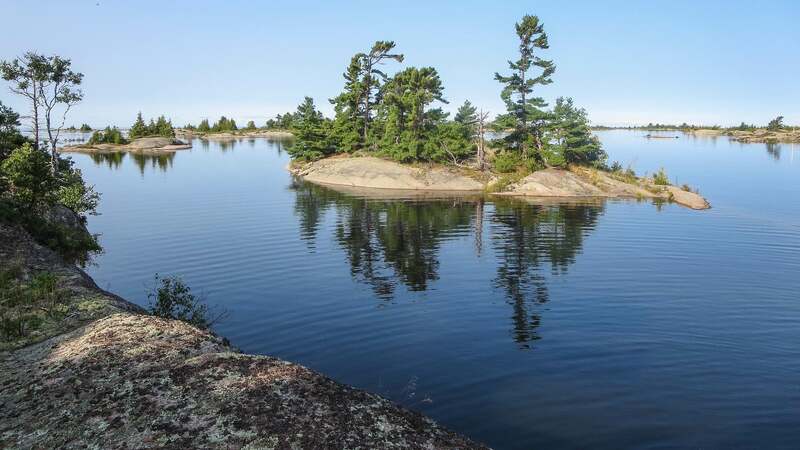 Our goal was Elmtree Island and a campsite that Rick had used before but as we approached we could see that there were already people there. 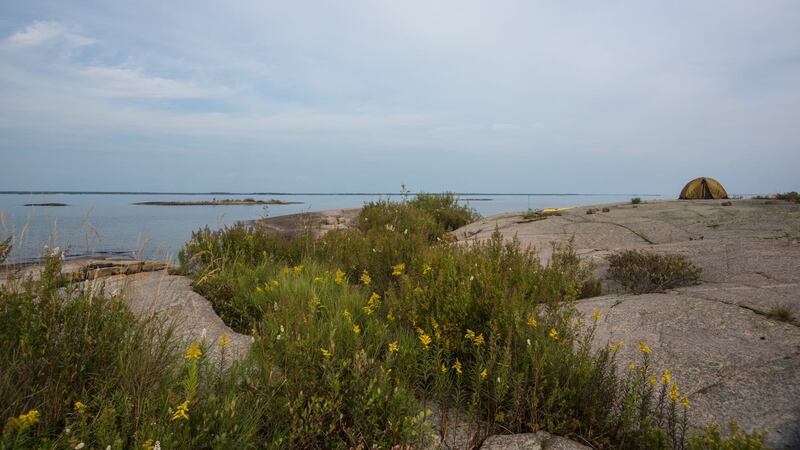 So instead, we pulled ashore on the island one up from it – the northernmost of the Mink Islands. That would be Garland Island, our home for the night. 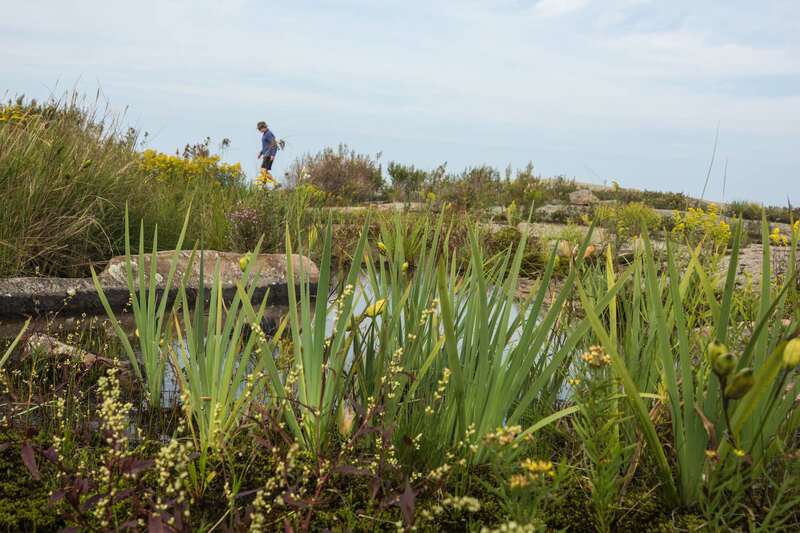 It allowed for an opportunity to ramble around and access different views of the rockscape and seascape that makes G’ Bay so special. Day 6 – from Big McCoy to Garland I. We arrived at Garland Island shortly before 4 and, as always, the tents went up first before we switched into a more relaxed mode. 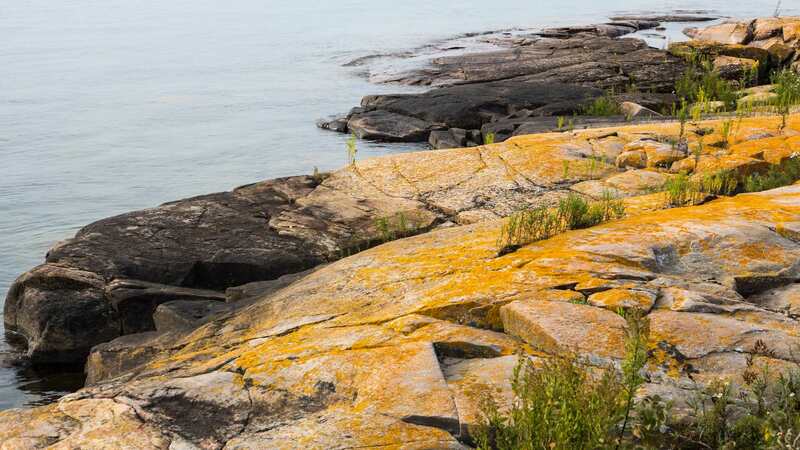 A carpet of sunburst lichen (Xanthoria elegans) covered the horizontal rock face along the shore. 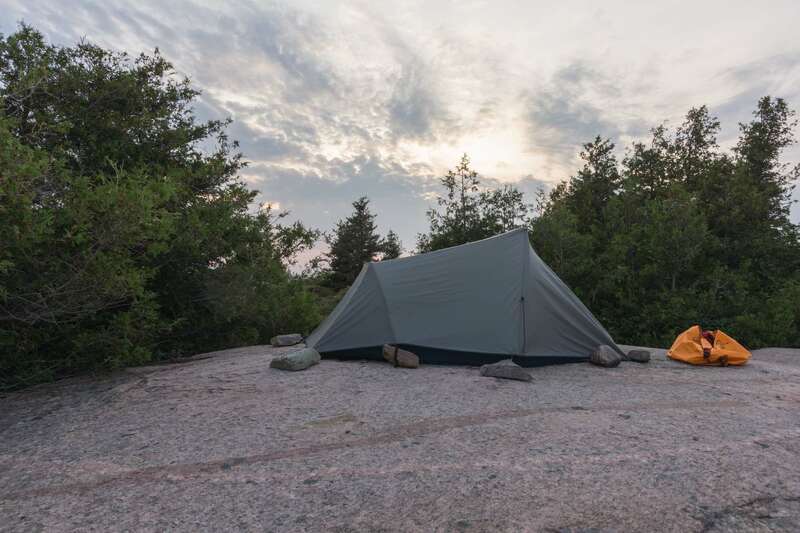 my tent on Garland Island – well-anchored! On the first two days I had tried to set up my tent in sheltered spots with a bit of earth underneath that I could push my tent pegs into. I would learn that this is often not possible – or even ideal – on a G’Bay trip! The shot above shows my obsession with securely anchoring my tent. There must be two hundred pounds of rocks weighing the tent down! Our trip was nearing its end and we had been given almost ideal weather for most of our trip. Our vehicles were at Snug Harbour, less than twenty kilometers away. we could paddle down the Minks and then cross over to the south end of Franklin. While we were hoping for the second option, it would be the wind and the waves that would determine our choice. 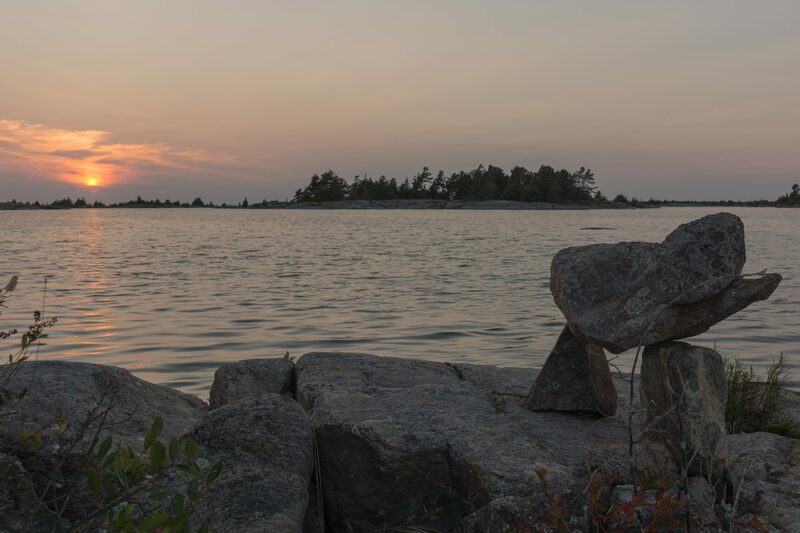 This entry was posted in Georgian Bay, kayaking, wilderness canoe tripping. Bookmark the permalink. I’m playing the “young hoot owl” as I grabbed a power nap earlier then proceeded to find your most recent posting. I’m starting to wish you don’t finish this paddle as it’s getting more interesting as you paddle further! 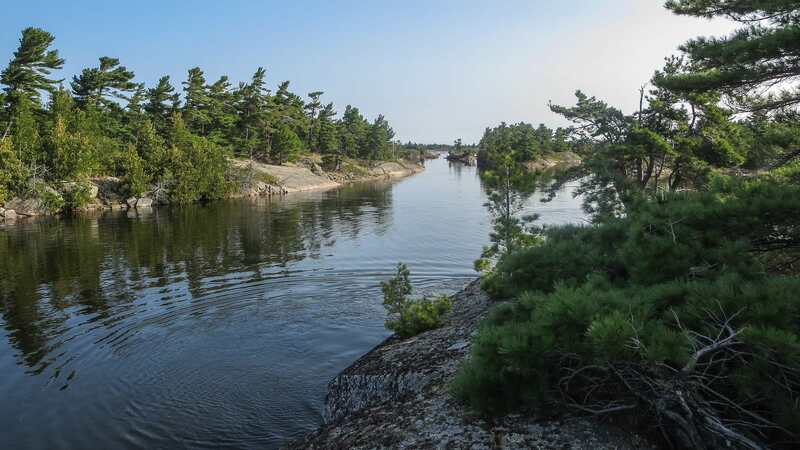 Hasn’t been mentioned but are you in the 30,000 islands now or have you passed through them? Garry, congrats for reading! Hopefully a few of the pix capture some of what makes the G’Bay coast so special. 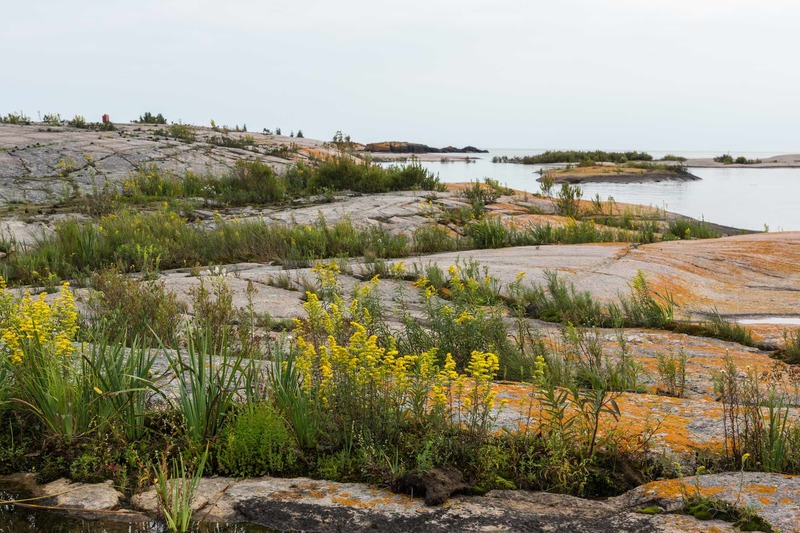 Re: the 30,000 islands. I am not sure if that refers to the entire Georgian Bay or just a section of it. 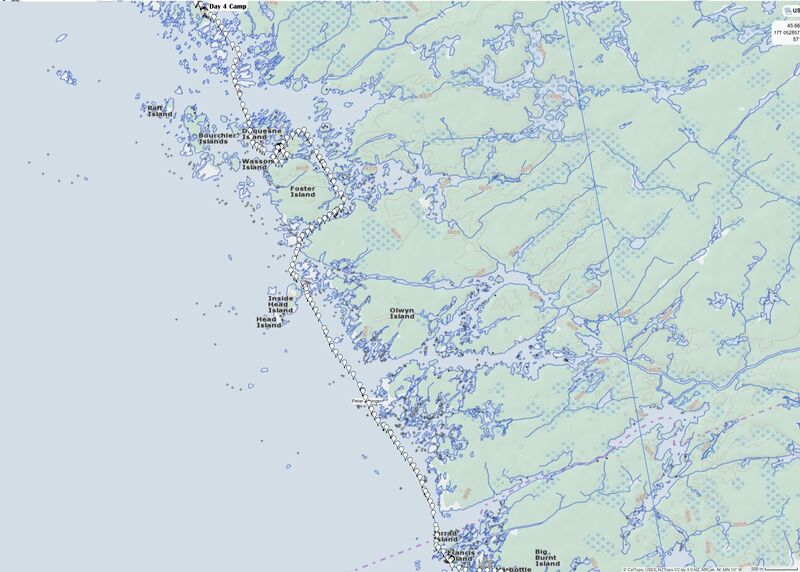 My impression is that most of those islands are on the east of the Bay as you go down from Killarney to Midland. 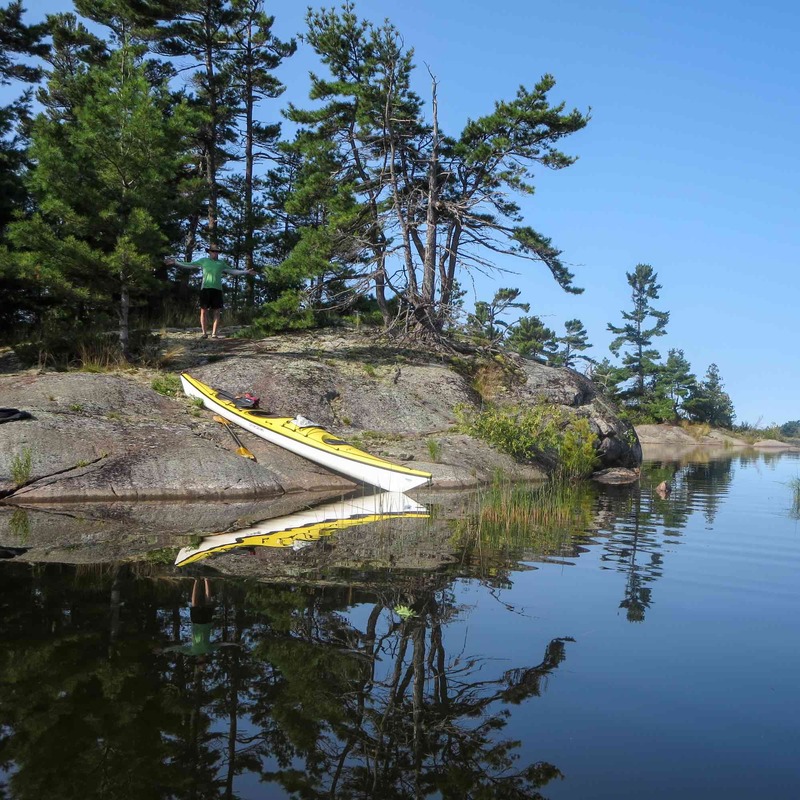 They have a 30,000 Islands cruise boat out of Parry Sound which seems to be popular though the best way to experience them is clearly in a kayak! Very nice write-up of your trip. Sounds like you had mostly good weather and a great guide. Thanks for sharing your trip with us. My wife and I are planning to do this trip this summer. We have done most of it in bits and pieces – now it’s time to put it all together. 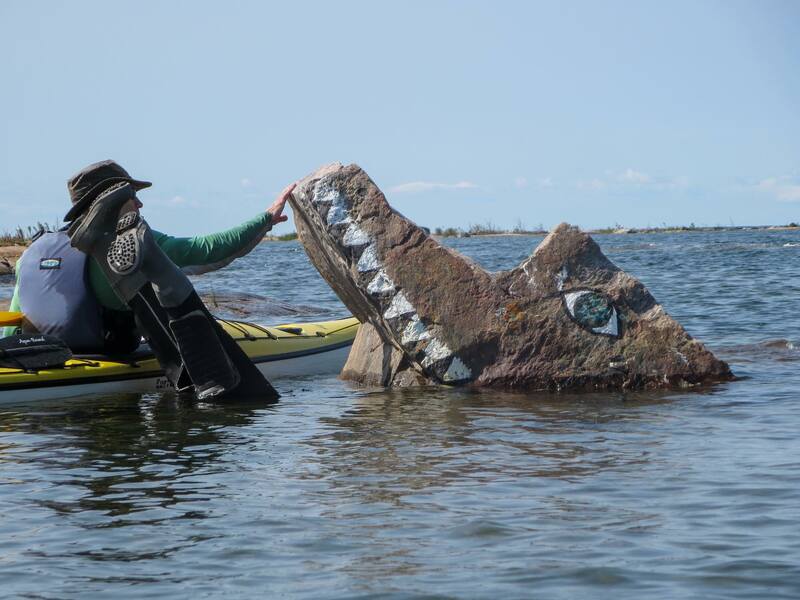 BobnCarol – enjoy your extended paddle down the G Bay coast! May you have the same great weather we did! Check out the excellent Kas Stone book for some additional tips on places to visit. Thanks for the positive review! If you upload a trip report, send me the link and I’ll include it in my post.